Great Escape Game: Daytons #1 Escape Room! You have one hour to find and solve clues and puzzles in our rooms to escape! CHOOSE YOUR ADVENTURE! Escape games have come to Dayton, and it’s a brand-new entertainment experience! Each Game is a real-life escape room adventure for a small group. Work together as a team to escape the room before time runs out. Escape games are perfect for groups of friends, family, or coworkers. Solving puzzles and cracking codes, you'll have a great time - but remember, you have just one hour to escape your room! The time is here! Your inside man informed you that a large sum of money was transferred to the Central Bank. Hence, you and your team made a plan to break into the bank and escape with the loot! Finally, your inside man gave you the blueprints to the bank in addition to access to the vault room, but you need to crack the safe and to collect as much as the loot before the guard returns. You only have a one hour window to get the money and escape so hurry! Your group of tomb raiders were contracted to retrieve the riches of the Egyptian pharaoh. After you enter the tomb, the door shuts behind you, and a curse falls upon you because of the powers of the pharaoh. The group of tomb raiders before you is missing. Furthermore, the leftovers from a past group of tomb raiders are in the room opposite of the entrance. The only way to escape the curse is to get the treasures of the pharaoh, lest the people in the tomb suffers the plagues of his curse. Hence, you have one hour to find the riches and escape or endure the same fate as the tomb raider group before you! You and your team in the contracts branch have been handcuffed in the top secret room in Area D at Wright-Patt Air Force Base. Also, the terrorists armed a nuke located in Area D and it will go off in one hour if you don’t stop it! You’ll have to figure out the codes to disarm the nuke while in the top secret nuclear room. Maybe you have just what it takes to stop it. Therefore, do what you can in order to save the base and the nearby cities because there is no one else that can do it! A deadly virus is taking over the world, wreaking havoc. You are infected with a virus and you are running out of time to find the cure. Rumor is that a cure exists inside a high tech lab that is near you. You and your group find the same lab where the cure is being stored. As a result, you and your team make your way inside the lab but have tripped the alarm and you are now locked inside. The cure is almost in reaching distance. Your time will run out in one hour to find the cure and find a way out of the lab because the virus will take full effect soon! Hurry since you only have one hour! You’ve been arrested for your involvement in the attempted robbery of H&K Banking. The prosecutor has exactly what they need to put you away for a long time. There is only one copy of the evidence holding you accountable and the warden stores that evidence somewhere in the prison. You must find the evidence and escape without a trace before your trial begins in one hour or you’ll be locked up for good. The owner of the saloon has gone missing and the prospector will be here in one hour with his men to collect the final deed that he needs to own the whole town. Once he owns the town he’ll have total control and can start drilling for oil. You and your team must find the deed to the bar before the prospector arrives, or the entire town of Desert Ridge will be lost to his hunger for wealth. Looking for a way to make your next corporate party, birthday party, graduation, or special event stand out from all the rest? Then check out the mobile escape room at Great Escape Game! Great Escape Game is offering a brand new mobile escape room experience in Dayton Ohio that we will bring to your house, work, or school! 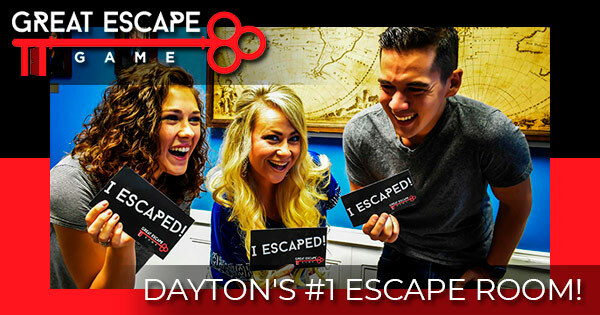 Find more events like "Great Escape Game: Dayton's #1 Escape Room!"